I'm teaming up with a group of bloggers for a Back-To-School product swap. Cara from Creative Playground has coordinated this fun hop so that you can learn about some TpT sellers and their fabulous products. I am sharing a product from Mrs. Martin Learns. She teaches 7th grade special education, and has 3 young children of her own. She enjoys creating educational products for all ages! 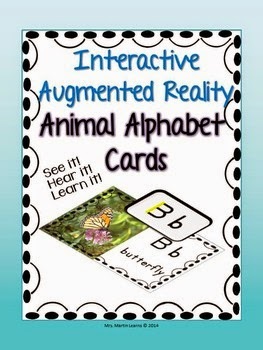 Her product is called, Alphabet Phonics Posters and Cards with Augmented Reality. Augmented reality?!?! You might not know what that is!!! I know that I didn't! Keep on reading and you can learn all about it! Augmented reality is a great supplement to your classroom curriculum. These alphabet picture cards are embedded with "markers" that, when scanned by a device (such as a tablet or smartphone), provide information about letters of the alphabet in a video format. If you are looking for more activities to use with your classroom technology, you should give this a try! It will keep your students engaged while they learn about letters! This works perfectly for your little learners - Pre-K through 1st grade, basically any students who need reinforcement of letters, letter sounds, and/or letter formation. Prep your devices by downloading the FREE Aurasma app and then following the Mrs. Martin Learns channel. Next print out the alphabet cards and you are ready to go! Students access the Aurasma app and then hold the device over a picture card. The picture then appears to come alive as the animal says the letter name and the letter sound. Then the letter is traced - showing correct letter formation. Next a short little video is shown focusing on the letter from the picture card. Head over to her TpT store to find this terrific product!!! And it is on sale for 50% off through Sunday! And you can read about my product, Circle Sorts, on her blog HERE! Thanks for participating in the swap friend!